Eastern Congo’s “Terminator,” the rebel chief and erstwhile Kinshasa ally Bosco Ntaganda, has apparently gotten spooked. Two weeks after Thomas Lubanga, Ntaganda’s former boss, was convicted for war crimes by the International Criminal Court, and amid calls by the Congolese civil societies and the international community to arrest him, Ntaganda appears on a mission to orchestrate a show-of-force in the Kivus. The CNDP—the rebel group for which Ntaganda served as the second-in-command of the armed wing—integrated into the Congolese regular forces in early 2009. Ntaganda was assigned the role of assistant coordinator for the more than three-year-long military operations called “Amani Leo,” Swahili for “Peace Today,” aimed at cracking down on foreign and local armed groups in the Kivus. He used that authority to build up a network within the army to expand his influence far beyond the CNDP’s former strongholds. Now it seems Ntaganda was behind the defection of some ex-CNDP senior officers, while some of his other closest allies have traveled to the Congolese army HQ in Kinshasa for training in preparation to be redeployed outside the Kivus, Bosco’s area of control until now. Evidently worried about the continued loyalty of the commanders headed to Kinshasa, Bosco reportedly threatened those who apparently broke away from him that “they would never again be allowed to walk on Kivu’s soil if they boarded the plane to Kinshasa,” an ex-CNDP officer told the Enough Project. Despite the threats, the ex-CNDP officers attended the training, including Col. Bisamaza Richard, Col. Emile Nsengiyumva, and Col. Innocent Gahizi, who, it turns out, is Joseph Kabila’s brother-in-law through the president’s second wife. President Kabila’s renewed push to reassign the ex-CNDP outside the Kivus, which the ex-CNDP have long opposed, is likely a concession to the international community for accepting his rigged November re-election. Just last week, the Belgian foreign minister visited Kinshasa and publicly called for Bosco’s arrest. In North Kivu province, prominent ex-CNDP officers within the Congolese army, or FARDC, are said to have defected. Col. Innocent Zimulinda, 812th regiment commander and Col Baudouin Ngaruye, commander of Ngungu based FARDC 3rd sector are among the most influential. 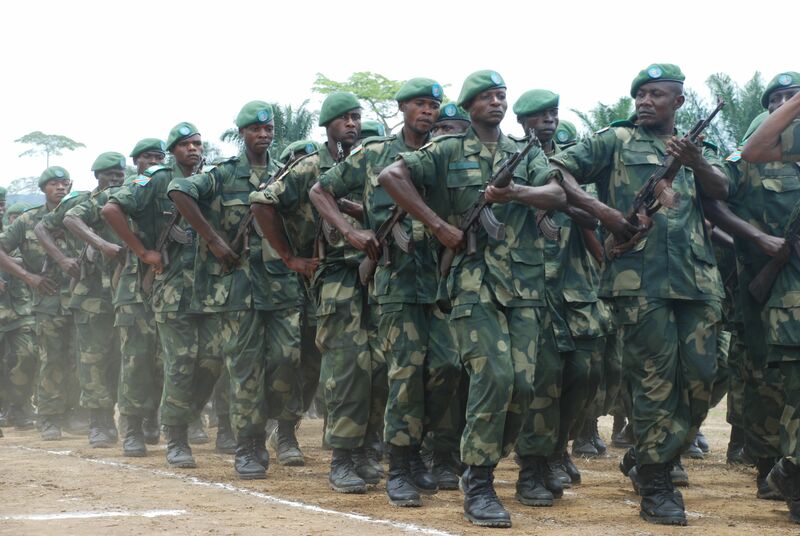 In South Kivu, Col. Makenga Sultani, South Kivu’s operations deputy commander, is said to have spearheaded the defections, followed by Col. Biyoyo, 103rd regiment commander in Nyabibwe; Col. Bernard Byamungu, 105th regiment commander; and his deputy commander, Col. Nsabimana, both based in Fizi/Baraka territory. While parts of the regiment units of these commanders remained loyal to the government, military experts in Goma estimate nearly 35 percent of all the troops formerly under Bosco Ntaganda defected. The mutinous commanders and their troops have been gathering in several areas including Mushaki, the former CNDP parallel administration HQ, 54 km west of Goma; Runyoni, in the Virunga National Park north of Goma in Bunagana/Rutshuru territory near the Ugandan border; and Katale’s coffee plantation, also north of Goma, where they have set up roadblocks demanding a go-pass of between $10 and $15. According to an FARDC officer, defectors from the North Kivu main military camp at Rumangabo have left with all the weapons. Bosco allegedly left Goma for the ex-CNDP HQs of Runyoni and Mushaki about a week ago and reportedly took one month’s worth of pay destined for the FARDC regiment in Lubero with him. Probably to cover up that Bosco Ntaganda is being protected and that the eventual long-time rumored goal of the ex-CNDP is secession of the Kivus, the 17 defecting colonels and lieutenant colonels recently sent a memo of discontent to the Supreme Commander-President Joseph Kabila. The letter lays out their dissatisfaction with unimplemented promises that date back to their integration in 2009 and some basic challenges in the FARDC, including military logistics, salaries, and housing, among other grievances. The letter also included a list of issues that has damaged their confidence in the military hierarchy: Attacks and killings of ex-CNDP in areas outside of the Kivus, which reduces their confidence in being deployed elsewhere; the fact that the upper echelons of the military hierarchy are openly divided; the unequal treatment in payment and logistics; and the kidnappings, arbitrary arrests, and the unfair judicial military system with jurisdiction in practice over only the ex-CNDP segment of the military. In conclusion, they said they refuse to serve outside the Kivu region. While the claims sound legitimate, it’s difficult to believe that their concerns are genuine, given that most ex-CNDP senior officers have been tacitly authorized to amass enormous wealth, especially Bosco Ntaganda, who has been called “the kingpin” of conflict minerals smuggling in eastern Congo. On April 1,the same day the defections broke out, Joseph Kabila dispatched a high profile FARDC delegation led by the ground forces commander General Gabriel Amisi Kumbayala to help avoid seeing eastern Congo’s military split in two. The demand by the ex-CNDP officers to have a negotiator other than the General Chief of Staff or the Chief of Staff of the Land Forces—a point made in the above-mentioned letter—has apparently been ignored. But the talks with Bosco have reportedly already failed and the delegation has returned to Kinshasa, despite a statement by Amani Leo spokesperson Col. Sylvain Ekenge that “the FARDC is one body and the situation is under control.” In reality, with the failed negotiations, the security situation on the ground could quickly deteriorate.